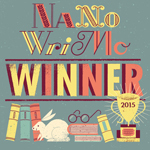 For the seventh year in a row I’m been participating in the challenge called National Novel Writers Month (NaNoWriMo). For the uninitiated, NaNoWriMo is a fun approach to creative writing. On November 1, participants begin working towards the goal of writing a 50,000-word novel by 11:59 PM on November 30. Valuing enthusiasm, determination, and a deadline, NaNoWriMo is for anyone who has ever thought about writing a novel. I am currently polishing The Seventh Sister, last year’s NaNoWriMo work in the hopes of publishing it mid-2018. This is the story of group of women in a near-future world who band together to save themselves and their families from a group of bandits the are terrorizing their small farming community. Their home of Verdant Valley is the agricultural center of the enclave known as the Babapupa Reserve. For all the years of the drought, the officials of Verdant Valley have given the motorcycle gang known as the Demon Spawn a portion of their harvest to stave off worst depletion. Now the Spawn want more. More than the people of Verdant Valley can pay and survive. Early next spring I’ll be looking for beta readers for this work. Please let me know if you’d be interested in join that small group of early readers. And watch for more information about The Seventh Sister as I get it ready for publication. This year’s story, tentatively entitled The Hybrid, follows April Marshall who, after a prognosis of early-onset non-Alzheimer’s dementia, is invited to participate in a study that offers the possibility of delaying or reversing her decline through the implantation of an artificial intelligence device. Of course, all is not what it seems and April’s device become more than she expected. I’ve been neglecting this blog for many (many) months but starting today I’m going to try to do better. My plan is to add two new posts a month. Around the second week of the month I’ll be updating you about my current writing projects and letting you know how you can learn more about The Baron’s Box. The fourth week of the month I’ll be sending you something I think is interesting. It might be a tidbit from one of my current works in progress, a review of something interesting I’ve read, my thoughts of the state of the world (but not too much political content, you’ve got plenty of other places to read that!). I may even experiment with new media — a video or cartoon, perhaps. For today’s update you may be pleased to know I’m again participating in National Novel Writer’s Month. NaNoWriMo is a challenge to write 50,000 words in the 30 days of November. Winners get the pleasure of having written, some goodies from the sponsors, plus a lovely print-it-yourself certificate. I’ve participated for several years — The Baron’s Box began life as a NaNoWriMo project. My project this year, tentatively entitled The Hybrid, tell the story of April Marshall who begins the story with the prognosis of early-onset non-Alzheimer’s dementia. She is invited to participate in a study that offers the possibility of delaying or reversing her decline through the implantation of an artificial intelligence device. As of this writing I’m about 25,000 words into the story. Wish me luck. Join my fans by signing up at Dr Mary Ann’s Academy.